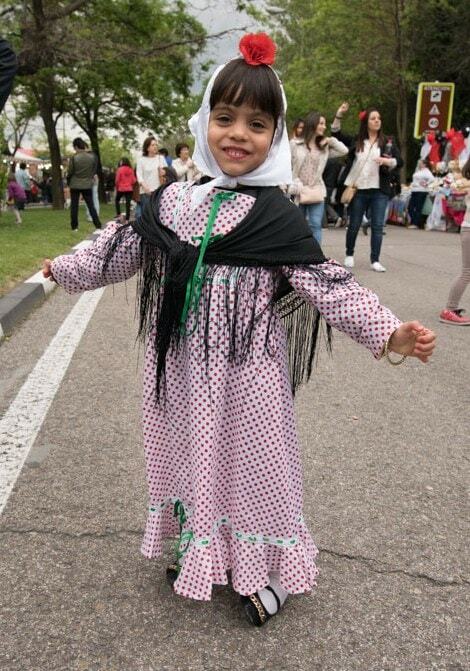 Every May, Madrid has a fiesta to celebrate their patron saint, San Isidro. The saint’s day is May 15, but there are festivities for over a week. The saint is known as San Isidro the Laborer. And the term laborer does not refer to working in general, but refers to working the land as a farmer. The legend of San Isidro goes back to the early 12th century. Isidro’s son fell into a deep well, and Isidro and his wife prayed, resulting in the water miraculously rising to ground level, bringing the son to safety. In gratitude, Isidro and his wife vowed abstinence and lived separately from then on. It makes you wonder what they would have done if their son had drowned. There is a tradition that Isidro caused a spring to come forth. The healing powers of the water from this spring were recognized when Prince Filipe recovered his health after drinking from the spring – back in the 16th century. I watched the faithful drinking the miraculous water from the fountain there in the Pradera, outside the church of San Isidro and his wife, Santa Maria de la Cabeza, There were several men dipping pitchers of water to serve to the faithful. Another legend involves the fact that Isidro would pray in the morning, and arrive late to work. His coworkers complained to the land owner that Isidro was lazy and late. When the land owner investigated, he found Isidro indeed praying, but an angel was doing his ploughing for him. Isidro was canonized in 1622, and because he was born in Madrid it was only logical for him to become the patron saint of Madrid. A typical sight in Madrid during these fiestas are couples dressed in the traditional costume, and they are called “chulos.” Below is a photo of a chulo couple in the Pradera of San Isidro. 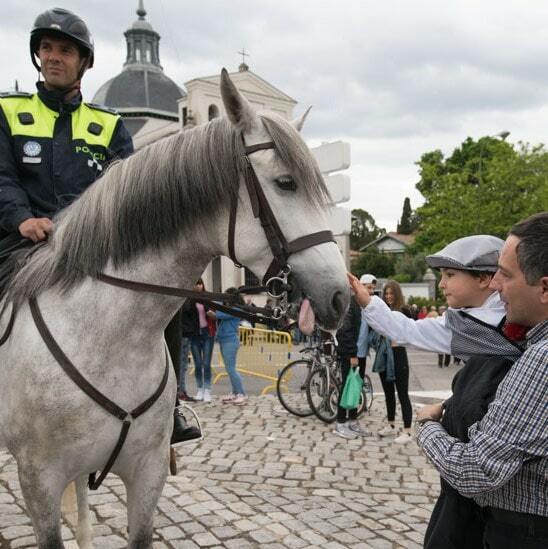 There are also photos of some young ones dressed chulo – including the little boy petting a policeman’s horse. There is a typical dance, the “chotis,” and it is common to see chulos dancing the chotis during this time. Also there are typical sweets – rosquillas, which is a type of aniseed doughnut. In fact, as I walked through a market with friends Juan and Pilar, a woman dressed as a chula was offering rosquillas to everyone in the market. San Isidro is also when the bull fighting season is kicked off in Madrid, and some of the biggest names are there to perform. In the plaza Mayor there were various regional dance companies, all in traditional dress, performing on a stage. 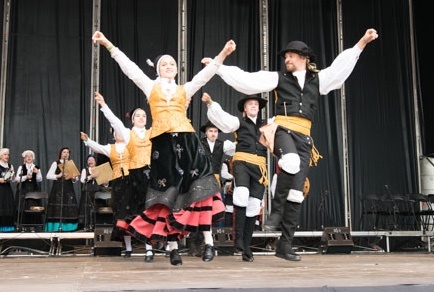 Below is a picture of one of the groups from Galicia in Northwestern Spain. Here are a couple final notes unrelated to the San Isidro fiesta. I had several discussions with friends about the differences between foreclosures in the USA and those in Spain. We all know that in the USA, if a home owner defaults on his payments, the bank can foreclose and take the house back. The bank can then sell the house to someone else. But the original owner who defaulted is forgiven the debt, as the house was the collateral for the loan. In Spain, when the bank forecloses on a house, the bank takes ownership and sells the house to someone else, just like in the USA. But in Spain, the bank does not forgive the debt, and the former owner still owes the bank the remaining mortgage. So the former house owner looses the house but still owes the bank everything remaining on the mortgage! One night Juan, Pilar, and I went to the Matadero Madrid. The Matadero is the former city slaughterhouse, which has been converted into a cultural center. There are theaters – both movie and play – and many other artistic institutions. I went to see Juan and Pilar’s recommendation – a play titled “El Jurado” (The Jury), while they went to see one of the movies. El Jurado was loosely based on the movie “Twelve Angry Men.” In El Jurado, a jury of nine is deliberating over a trial of a corrupt politician. (The news in Spain over the last several years has been full of stories of corruption by politicians of both of the major parties.) In the beginning of the play there is only one juror who votes not guilty, but over time he convinces the others, one at a time, to change their votes to not guilty. At the end there are two jurors left on stage – a woman who was the last holdout, and the convincer. We find out that the convincer used various tricks and lies to convince the others to change their votes to not guilty. Pepón Nieto is the actor that plays the convencer, and his last words to the woman were to tell her to be sure to vote. Well, I had had a t-shirt made to copy one I had seen someone wearing several times as I walked to the Metro. It says: “EN LAS PROXIMAS ELECCIONES VOY A VOTAR A LAS PUTAS POR QUE YA ESTOY HARTO DE SUS HIJOS.” In English this would be “in the next elections I’m going to vote for the ladies of the evening because I am fed up with their sons” (in Spanish, sons of the ladies of the night is SOB). The next night I put the t-shirt on and returned to the theater at the ending time for El Jurado. I enjoyed some wine and tapas at the theater’s bar until Pepón came out to mingle with the spectators. I went up to him and said, as we had upcoming elections, I had this special t-shirt made. He enjoyed Reading the shirt, and said he would end the play with that saying the following night. These five posts on Spain 2016 represent the highlights I thought could be of interest to many people. I wrote of many other meals and conversations with friends, but decided those might not be of interest to the general public and therefore took them out. What follows are my posts and photos of the month of June in Peru. Also, please sign up for free updates to get notified of new posts.